Pull-along toys come in so many shapes, sizes, and colors today that it is hard for parents to choose the best ones for their kids. We help you narrow down the vast selections on the market with this list of the best-rated items by parents just like you. These are the pull toys that parents are raving about and the ones that delight their kids with hours of pleasure and activities. Simple pull-along toys can benefit toddlers in so many ways as they learn the skills of walking and crawling. Whether your child is still crawling, just beginning to take a few steps, or has mastered most of the basic skills, pull-along toys can be of great value to them with their many features. Toddlers six months to three years old will love this pull-toy with its big colorful rocks and various push buttons on the truck. Three boulders or rocks in different colors are included for fun play when the truck is not being pulled. The idea of this pull-toy is unique and effective. 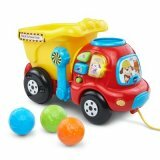 It is a charming little dump truck with colorful rocks that appeals to boys and girls of varying toddler ages. The Drop & Go Dump Truck is not just a pull-toy, but it is a teaching tool for colors, numbers, tools, songs, and fun phrases. There is so much to do with this nifty little item; it just astounds us! Skills obtained with this toy are gross motor abilities, listening talents, hand-eye coordination, and finger dexterity. Boys and girls will both be excited to give this little truck a spin and load it up with the colorful rocks that make a unique sound when they are tossed in the truck bed. With these toy rocks, various activities consist of watching the bucket shake and rumble the boulders when it rolls along; moving the handle to lift the truck bed to tip the boulders out; dropping the colorful rocks into the truck to hear them counted; and pushing the side buttons on the toy to hear phrases and songs. The buttons also teach information about different tools and colors. One of the most fascinating toys a kid can ever have is a toy car. 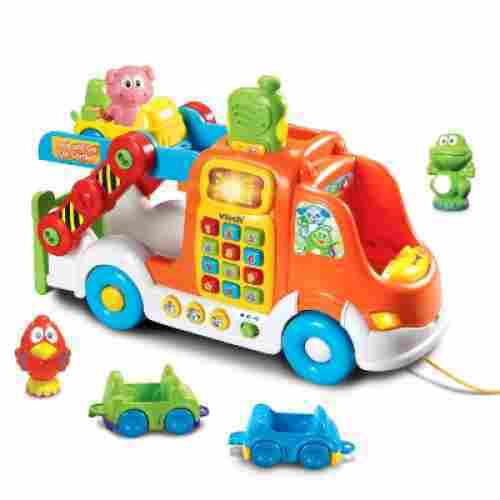 Now imagine giving your little tot the VTech Pull and Learn Car Carrier Pull Toy and he or she will simply be playing with amazement. As VTech is known for their well-constructed toys, this Pull and Learn Car Carrier is no different. The toy set comes with a huge car transporter with a fully operational flip-down ramp to allow access to the upper deck of the transporter. It also comes with 3 colorful cars with 3 cute animal figures. It is a portable yet versatile toy that will ensure that your child has a boat load of fun times. Though the string might be too short for some children, it can be lengthened at home. It will last through all of your child’s rough and tumble playtimes. So much more than just a pull-toy, this car carrier has three animal figures and three cars that fit into the pull-toy. Even when this toy is at a standstill, it can be used to educate children. The transporter head has a built-in activity center that features a CB radio that activates lights and sounds for additional children’s learning It also has several buttons that play interactive phrases about colors, animals, and numbers. 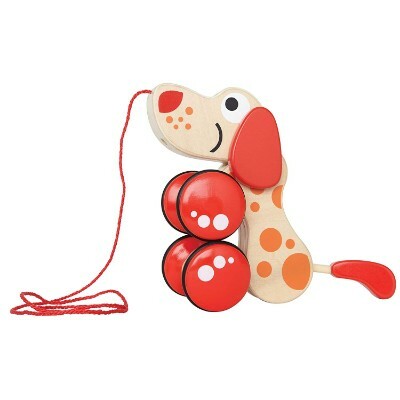 With a very sleek and colorful body that would remind you of a colorful Pluto, the Walk-A-Long Puppy Wooden Pull Toy is excellent for strengthening the arm and leg muscles of your little ones. The toy is made of premium quality wood sourced from sustainable forests and finished with child-safe and non-toxic materials. 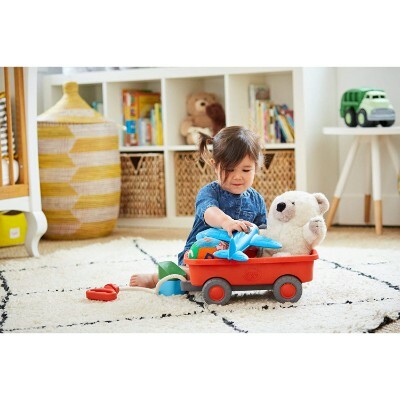 The 4 wheels of the pull toy dog is rimmed with rubber to allow for more efficient rolling on any surface as well as help prevent scratches off your floor and minimize the noise that may be present once your kid pulls on the toy. It can be bounced, dragged, and pulled down cement sidewalks or through the house on carpeted floors. It’s a versatile toy that will be used for years. 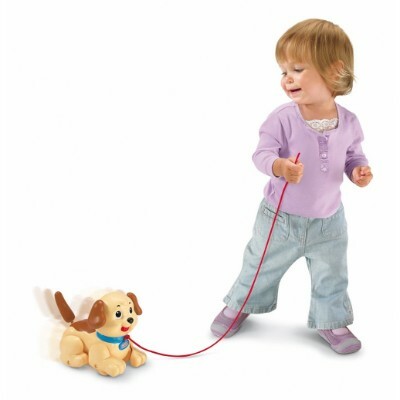 The dog design of the toy is an excellent introduction to walking a real dog. It thus lays the foundation for make-believe play while at the same time fostering a sense of independence as your toddler will be tugging along with his or her wheeled friend anywhere around the house. As a truly vintage styled toy, this wooden pull toy is sure to provide fun play time for your child regardless of their age. Whether they’re two years old or ten years old, they can still take it for a walk and play pretend. 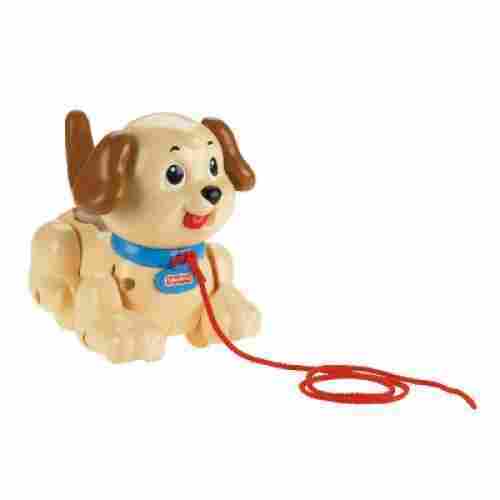 If you are looking for a pull-along toy with all of the modern trimmings, look no further than Vtech’s Pull and Sing Puppy. 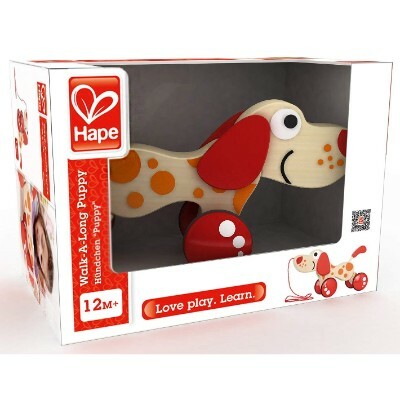 This delightful dog-shaped toy provides a plethora of interactable functions for children as young as 6 months and grows with your child up to 3 years! This toy provides a multitude of cognitive enhancing interactive features. The buttons on the puppy’s side introduce early concepts of numbers and colors while the phrases also bring parts of the body and puppy sounds to delight and entertain your child. 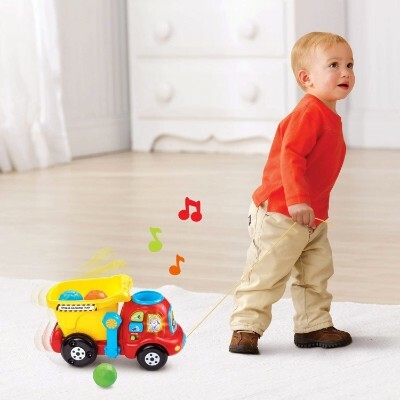 Once your little one starts walking, simply attach the pull cord and a whole new world of playful music opens up! The puppy’s legs move and the keys swing as it broadcasts over 60 different songs and phrases at the pull of a cord! Pulling on the cord is a great way to encourage early walkers while simultaneously developing fine motor skills and hand-eye coordination. 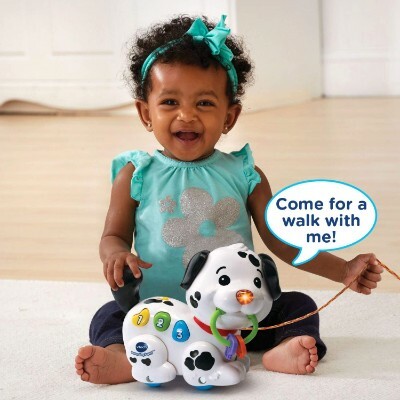 Pushing and pulling the puppy can foster gross motor skill development as well and the huge library of phrases, melodies, and songs will encourage language development in a fun and enjoyable way. This adorable little Dalmatian wants to play and features many buttons and light combinations designed to draw your little one’s attention. Three brightly colored buttons on its side, as well as an adorable key ring in its mouth, play music and phrases when your little presses them. The puppy’s nose also lights up and flashes with different interactions. Dogs are the most fun pets to walk. While your baby and toddler may not be able to control a real puppy yet, he or she can surely exert his or her control over the Brilliant Basics Lil Snoopy. For the price of this toy, it’s amazing how durable it truly is. Your child can learn how to take care of a ‘pet’, while also having an activity to do while you are out and about with them. 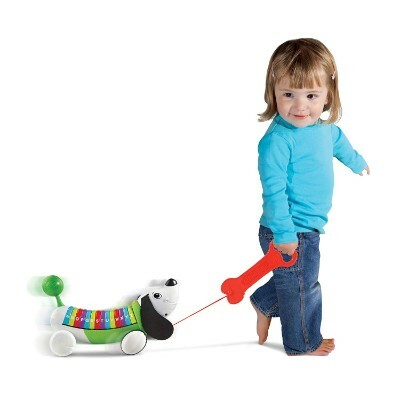 This Lil Snoopy pull toy wags his tail and moves his eye as he is being pulled. It will also encourage your child to learn about balancing a toy. It’s a really innovative way of introducing the concept of walking the dog to your kids. This helps them pretend that they are walking their real puppy. This helps train them on how to properly hold the leash, developing their fine and gross motor skills, and at the same time enhancing their hand-eye coordination. 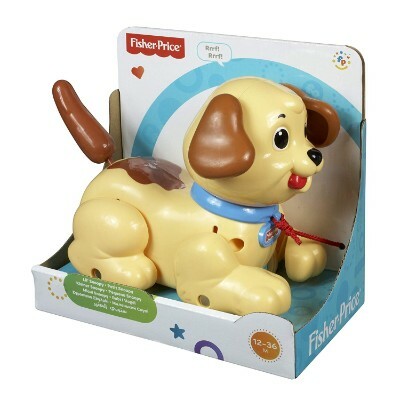 This pull-along toy dog barks, turns its head, wiggle its ears, and shakes or wags its tail when pulled. It does not require any batteries as the gears are fully activated by motion. The more Lil Snoopy is pulled, the greater the number of movements. So simple in its design, yet so effective in getting your children up and moving, this colorful little alligator is unbelievable. Even if your child is not walking yet, this toy will entertain them as it moves along with it wood pieces clacking together in rhythmic, soothing sounds that kids will love. 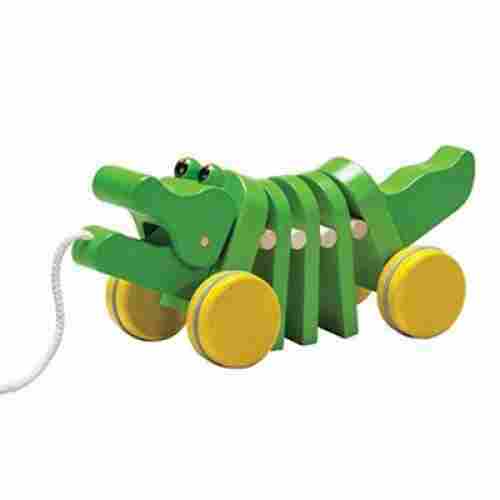 This Dancing Alligator by Plan Toy will encourage your child to get moving as they pull along their alligator for a walk. It will truly grow up with your child through its sturdy and durable build. Painted in the most vibrant, rich green paint, the pull-toy will have your child walking it on its leash in no time at all. As they do so, children will improve their balancing, gross motor abilities, and muscle strength. This is why it is called a dancing alligator. It seems as though it is dancing when it moves because of it ambling gait. By purchasing this toy, you will be doing your part in saving our ecosystem. The manufacturer believes and practices living green in producing its products. If you’re looking for a pull toy that is as adorable as it is functional, then look no further. AlphaPup will have your child moving and walking along as it plays its songs and says its puppy-related phrases. When the colorful buttons on the dog’s sweater are pressed, the letter and sound are said for your child to repeat. The puppy’s ears are soft and velvety to the touch, so kids will spend time petting their dog. Its tail wags back and forth as the puppy rolls along and the back end wobbles to give it a cute walk. Kids aged three and older will gain much practice with their phonics skills, motor abilities, and vocabulary building with this enjoyable product. Batteries are required for operation of the AlphPup, but the manufacturer has included them with the item. Most pull-toys give kids practice with gross motor skills, but this one also promotes petting the soft ears and playing with the bone-shaped cord handle. Kids love petting animals and they can do that and give it the bone handle to chew. 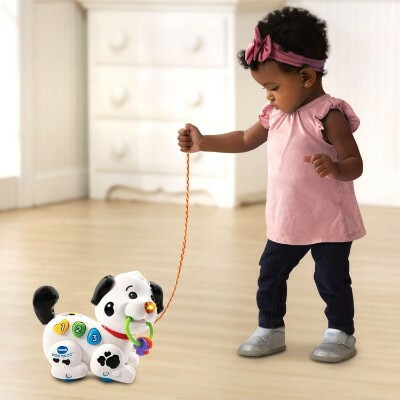 If the bone button is pushed or the bone handle on the leash is pulled, the toddler will hear fun, dog-related phrases. 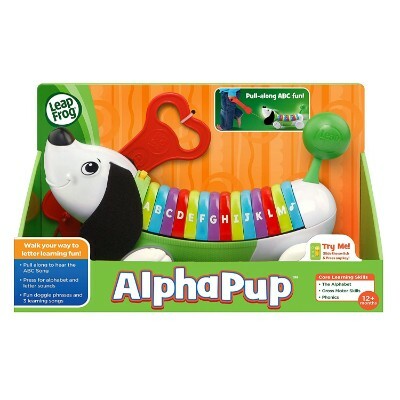 The AlphaPup is a wondrous toy that not only rolls along behind kids, but it can play fun songs, cute phrase, and the alphabet. The colorful stripes on the puppy’s sweater make all of this possible and engaging. With its big, chunky tires and low-riding bed, the vivid orange pull-wagon is a fantastic, quality product. It is made in the U.S.A., plus created from 100% recycled plastic milk containers and safe, soy inks. Even the packaging is recycled and does not contain twist ties or plastic film. There are no metal parts on the wagon, and it is free from PVC, BPA, and phthalate materials. This delightful toy wagon is perfect for outdoor or indoor play for boys or girls. It can be used to haul toys and other small items in the backyard, at the beach, or in the classroom or the playroom. The attractive pull-toy has a 100% cotton rope handle that tucks in the wagon easily for convenience, safety, and storage. 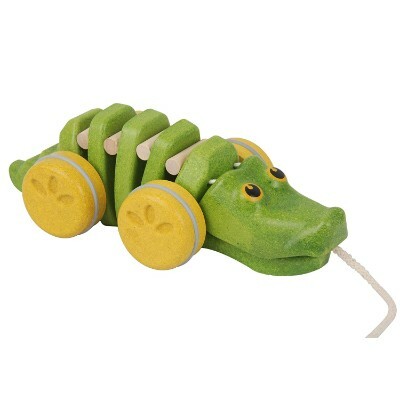 Intended for ages one and older, this pretty, little pull-toy promotes motor skills and imaginative play in toddlers. Encourage your child to get active with this bold-colored wagon and start hauling and moving for fun and entertainment. Loading objects into this adorable wagon and pulling them to their destination will exercise your toddler’s motor abilities, cognitive talents, hand-eye coordination, balance, imagination, and problem-solving skills. 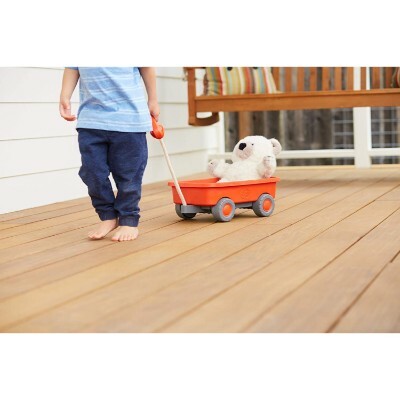 Load ‘em up and move ‘em out with this cute orange pull wagon! 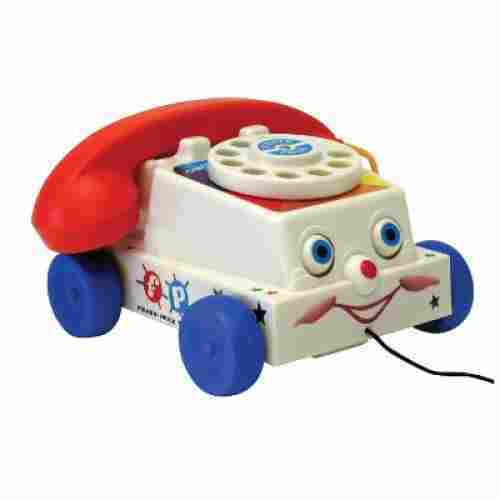 Children have been enchanted with this toy phone since 1961 because of its simple design that has so much to offer young kids. The basics of numbers, colors, and sounds are easily learned with the face of the phone and its movable dial. Its mouth moves too when the dial is touched to seem like it is talking to your child as they chatter away on the receiver. It is a part of technological history for kids to see what telephones used to look like not too long ago. It will be surprising to children that this device was the inspiration for the cell phones we have today. Even though phones have changed so much over the decades, kids still want to play with this little phone with the rotary dial in its bold colors of red, white, and blue. The dial rings and rotates when it is activated by tiny fingers, plus the eyes of the cheerful face roll up and down. The basic abilities of the Chatter Phone are gross and fine motor skills, finger dexterity, number and color recognition, and imagination talents. Who would have thought that a toy phone could teach so much? 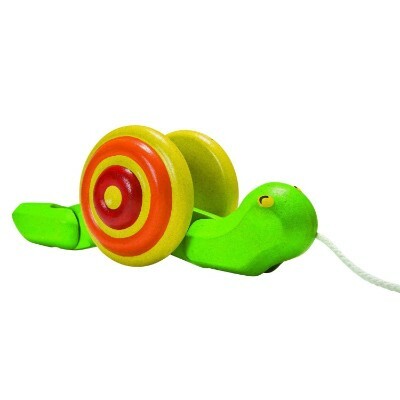 If your kid has seen the animated film Turbo and believes that he or she can find another Theo in your backyard, maybe you can make this dream come true by giving him or her the Pull-Along Snail pull toy. It’s expected that your child’s toy will have to endure some rough and tumble play. 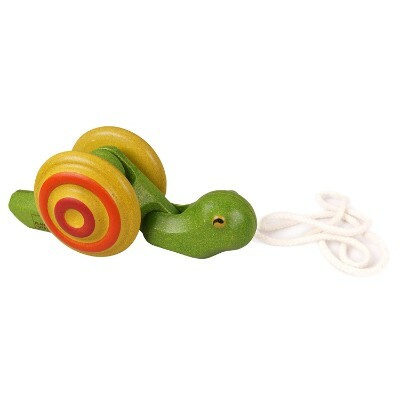 This Pull-Along Snail by PlanToys is durable and sturdy enough to last through years of play. As it’s a wooden toy, with no plastic parts, it’s easy to fix if something does break. It is a frustration-free toy for your child that rights itself up as your child pull it. This creates the impression that the snail is actually contracting its body to propel itself forward. The toy is also made of organic rubberwood that has been 100 percent recycled. This uniquely-designed and award-winning pull toy creates a very interesting movement. When pulled, the bright wheels representing the snail’s shell spin which in turn moves the body of the snail in an up and down motion. The Pull-Along Snail, Walk Along Puppy and the Dancing Alligator are some of the toys featured here that are made from organic, environmentally safe materials that will not harm your child, even if chewed on. Others like the plastic wagons were constructed of the best chemical-free substances that will pose no dangers. Pull toys help infants develop both their gross- and fine-motor skills which they can refine until they reach toddlerhood. Pull toys require good control of the muscles of the hand as well as the arm especially when pulling on the toy. Additionally, young children will need stronger leg muscles, a steadier gait and stance, and excellent coordination of the body and limbs as the young child attempts to move with the pull toy in tow. For the first three years of life, it is crucial to provide children with the correct kind of toys for their various developmental needs. Young children, particularly infants and toddlers, require a lot of sensory stimulation as well as physical activity to help fast-track their growth and development especially the development of their cognitive skills, social skills, and emotional skills. As the baby learns to master the control of his or her bodily movements, mobility and physical activity are enhanced. At the same time, the kid’s sense of exploration and experimentation is also stimulated. This leads to the discovery and appreciation of the things around the child which, in turn, can help impart an understanding of how the real world operates. This is especially true among toddlers as they already have the physical capacity for increased exploration. This generates new knowledge and new experiences which leads to social and emotional development. A few of the toys will give your kid a chance to do problem-solving with the activities added, such as the Drop and Go Dump Truck and the Car Carrier. 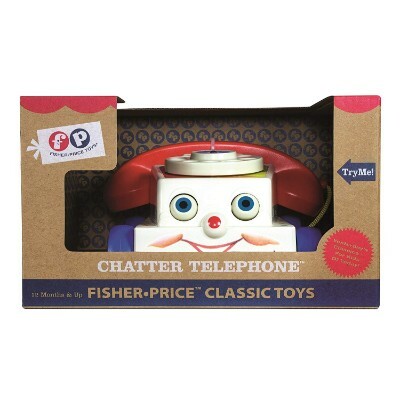 Because all of the toys are brightly decorated, children will be able to name and recognize numerous colors, plus get to know shapes and numbers with some items like the Chatter Phone. The more the toy can do, the quicker the child will advance to more complicated toys in the future. The extra features of some of the more advanced pull-along toys are for the older kids above the age of 3. The Car Carrier and Drop & Go Dump Truck are perfect examples of this type of toy. They include extra pieces for kids to insert or place into the body of the item for extra enjoyment. The rotary dial on the Chatter Phone provides kids with an opportunity to begin number recognition and counting talents in a stimulating way. q: Are the strings or ropes long enough to accommodate different sizes/heights of kids, or can they be extended somehow? You could always extend the cords or ropes of the pull-toys, especially if you have or can find material that is similar. However, you must keep in mind that the main reason for the short ropes is safety. If the pull cords were any longer, then they would pose a problem of tripping or tangling the child’s legs and feet as they try to walk with the toy. There could also be an issue of choking if the cord becomes wrapped around the child’s neck if left unattended to play with the pull toy. If you do decide to extend the cords, make sure they do not cause these problems for the toddler. q: Do any of these pull toys require anything extra, such as batteries or tools to put them together? A few of them, such as the AlphaPup require batteries, but they are included with the toy. Nothing else is required to enjoy the toys right from the packaging. q: Are there any choices for any of these pull toys, such as color, size, or different designs? Most, if not all, of the pull toys we highlight, have only one option for size, color, or design. Manufacturers, such as Melissa & Doug, do offer several types of pull toys, but each item has only one option when buying. q: Will these work on carpets as well as hard, smooth surfaces? Any surface that can offer some amount of traction will do better than ones that are very slick. Hardwood floors are not the best option for pull toys most of the time. Thin carpets work the best because they offer traction, but do not impede the rolling of the wheels of the toy. Small rugs or towels can always be put down on slick surfaces to help with the movement of the pull toy. q: Do any of these pull toys have small parts that would detach or come off accidentally and cause a swallowing issue? Do any of them make noise? Some of the pull-along toys do have separate pieces that fit into the main toy, such as colorful Pull & Learn Car Carrier. These parts fit into the bigger item like a puzzle to enhance learning skills. The Dancing Alligator and AlphaPup are such toys that make click-clack sounds as the wooden pieces hit together as the toy moves or they make sounds and say educational phrases aloud. q: Being that most pull toys are for toddlers already beginning to walk, are any of them okay for a child who is not walking yet? 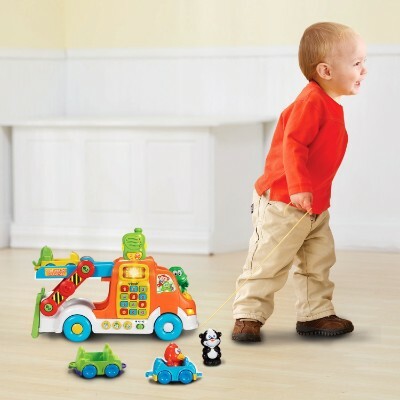 Any child who is crawling may be enticed to move and begin walking with these pull toys. As they see the toy roll along, they will be encouraged to follow. It is a great way to get them motivated into walking quickly. q: What is the best age of a child for these pull toys? What age would be too young and what age would be too old? Manufacturers suggest ages basically from 1 year to 3 years old for most of the pull toys. 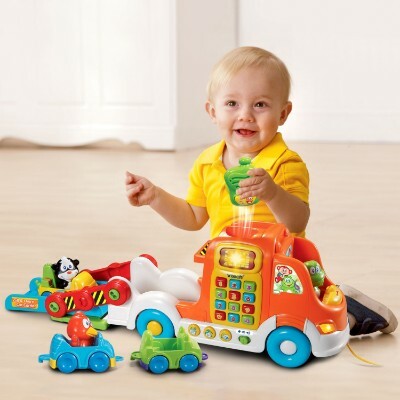 This is based on the attention level of the child with these simple toys, the walking abilities of the child, and the length of the cord to pull. Kids younger than 1 will not be able to follow the toy walking, but they can do so crawling. It would be a good idea to start them with the toys before they can walk to get them walking as soon as possible. Kids older than 3 would be mentally too old for such toys, the cords or strings would not be long enough for their height to the toy, and these children will already have great walking abilities to go on their own. q: Do any of these toys help or educate the child on anything besides walking or crawling? Are there any with some thinking challenges to them, like puzzles? 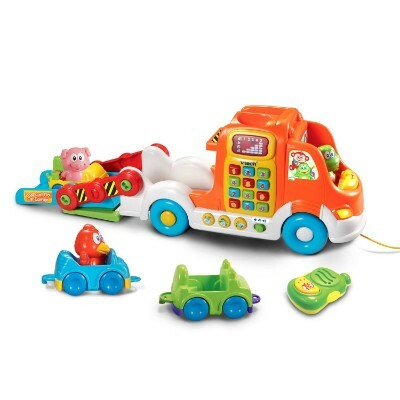 The Pull & Learn Car Carrier and the Drop and Go Dump Truck are two highlighted pull toys that are wonderful for extra skills. They each have smaller pieces that fit into the main toy, so they promote extra abilities such as color, shape, and number recognition as well as practice with fine-motor talents.